Ray Donovan is a Wow! I’ve never liked Jon Voight. I don’t have a good reason, he’s just never done anything for me. Of course I’ve seen him in a lot of things – there’s no avoiding the man. But, wow, he found the vehicle of a lifetime in Ray Donovan on Showtime. He is so perfectly Mickey Donovan – his walk, his tone of voice, his expressions, his questionable sincerity – his entire being is flawless in this part. I, who would never see anything simply because Jon Voight was it in, am telling you to see this if you can because of Jon Voight. If you don’t have Showtime, file it away as a must watch on Netflix or Amazon or Hulu or someplace like that in the future. The series is currently nearing the end of season 1. Here’s the trailer. Voight aside, the entire cast is exceptionally good at creating the gritty and steamy world of Ray Donovan . 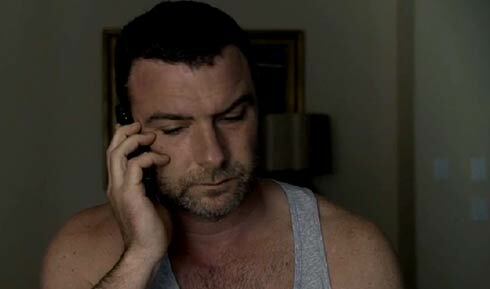 The title character Ray is played by Liev Schreiber. He’s an Olivia Pope from Scandal fixer sort of guy, except he uses violence more than cunning to do his job. Ray takes care of the illegal and misguided antics of the rich folks in L.A. while Olivia is keeping D.C. running smoothly. Ray is a family man, as his father Mickey is attempting to be on his return from 20 years in prison. But Ray keeps his family in the dark about his less than admirable work life. This is a source of conflict with his wife (ably played by Paula Malcomson) and his two kids (played by Kerris Dorsey and Devon Bagby). Ray is close to his brothers, Terry (Eddie Marsan) and Bunchy (Dash Mihok). As the story gets underway, Ray learns that he has a African-American half-brother, who serves to help push the plot line involving Mickey’s devotion to black women and their asses. (Mickey definitely knows what twerking is.) The half brother, played by Pooch Hall – a boxer in real life – has been hanging around the boxing gym Terry runs. Terry and Bunchy both knew about the relationship for years, a fact that does not sit well with Ray. That’s as far as family love goes with Ray. He hates Mickey for reasons that haven’t been fully explained yet. He doesn’t want his father near his own family or hanging around with his brothers – both things Mickey immediately does on getting home from prison. The series is a rich drama with lots of stories intertwining from a past full of secrets and lies as well as Ray’s present unsavory work. Worthy of special mention as supporting players are Kerris Dorsey (you may remember her from Brothers and Sisters ) as the teen-aged daughter, Katherine Moennig (from The L Word) as one of Ray’s assistants, Elliott Gould as a business partner hiding secrets from the past while quietly going cuckoo, and Paula Malcomson as Ray’s wife. A woman, Ann Biderman, is the series creator and writer. This matters to me. Showtime will let you watch episode 1 for free. I urge you to take advantage of the offer. All images property of Showtime. Author Virginia DeBoltPosted on September 5, 2013 July 10, 2015 Categories TV seriesTags Ann Biderman, Dash Mihok, Devon Bagby, Eddie Marsan, elders rock, Elliott Gould, Jon Voight, Katherine Moennig, Kerris Dorsey, Liev Schreiber, Paula Malcomson, Pooch Hall, Ray Donovan, ScandalLeave a comment on Ray Donovan is a Wow!